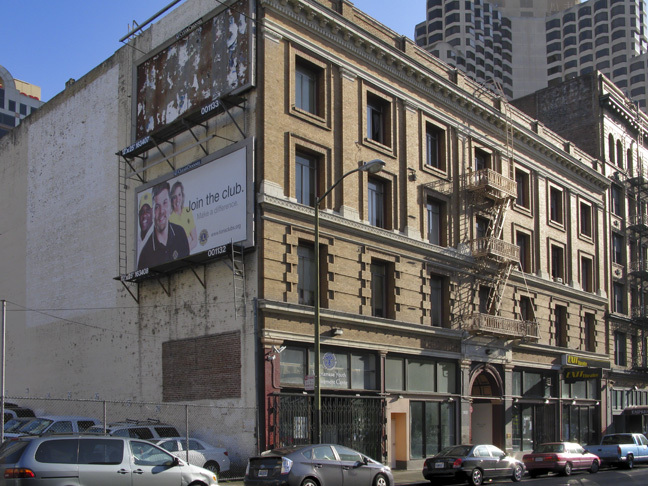 (340/7) 34–48 Turk Street; Hotel Dale (1910), Dalt Hotel (1984). Hotel with 193 rooms and seventy-eight baths. 7B stories; brick structure with decorative brick facade; galvanized iron cornice, decorative iron fire escape, decorative brick bands, voussoirs* and keystones; three-part vertical composition; Renaissance/Baroque ornamentation; desk lobby with cove cornices and column capitals; base and entry altered, new marquee. Original owner: H. Dale. Architect: Charles W. Dickey. 1910. *wedge-shaped elements of flat arches above the windows. 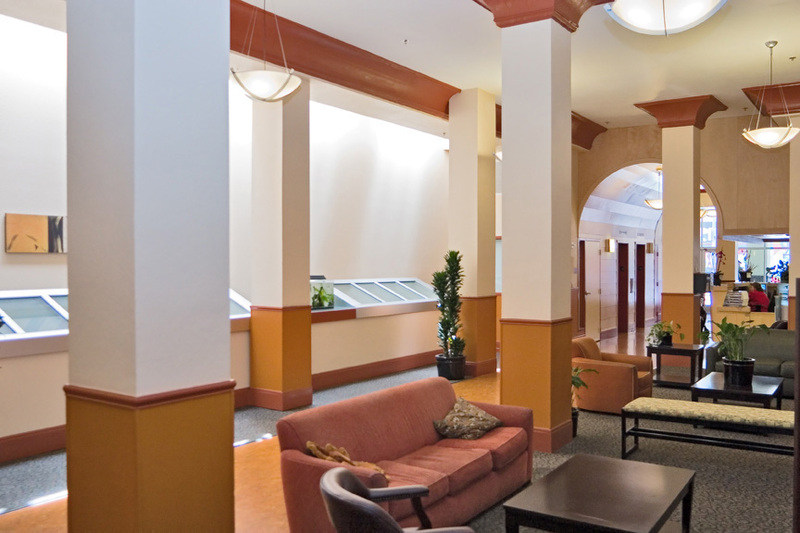 One of the Tenderloin Neighborhood Development Corporation’s many acquisitions, the Dalt has been renovated and now serves as so-called supportive housing. A storefront at 48 Turk Street is the site of legendary McDonald’s Bookstore (“A Dirty, Poorly-lit Place for Books”), which for eighty years was known as the place to go for bibliophiles in search of the offbeat and arcane. McDonald’s is even mentioned as “a second-hand bookstore on Turk Street” in Fritz Leiber’s wonderful book Our Lady of Darkness. 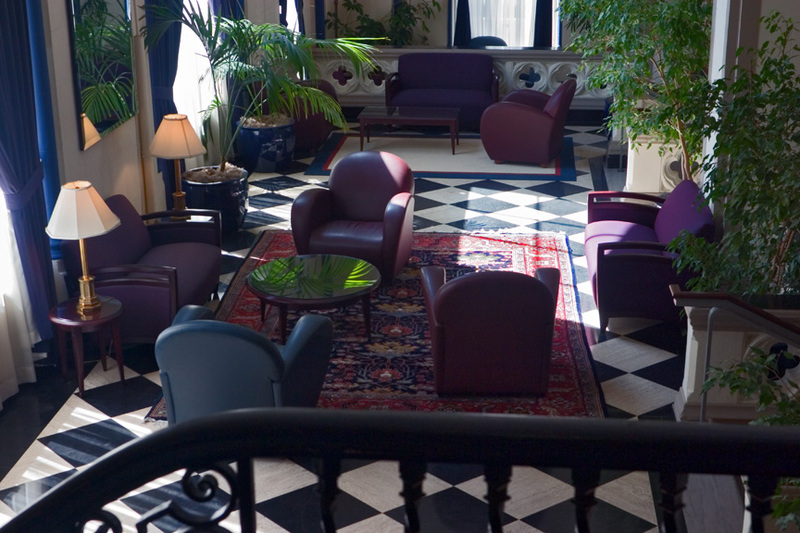 The lobbies of Tenderloin hotels and apartment buildings were important spaces. As descriptors of residents’ social status, their size and appointments varied with the pretension of the building (see also “Lobby, McAllister Tower”). Postcard, Hotel Dale, circa 1910. The Dale was a mid-priced hotel with distinctly bourgeois pretensions.